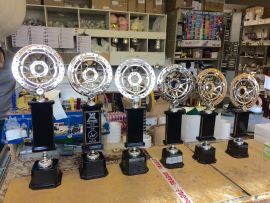 Size: -- Select -- 14"
A real quality set of trophies, created with imagination, sadly lacking in most trophy catalogues!!!! Sizes ranging from 16" upwards!!! For a custom-made set of Motorsport Trophies, please call us on 01865736028 and discuss your requirement and realistic budget!!!! Prices from £35.